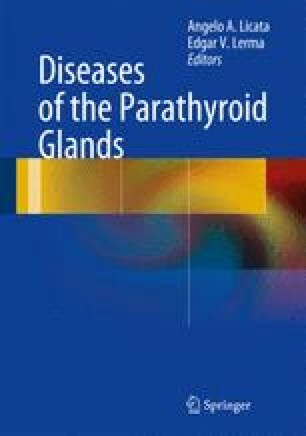 This chapter focuses on problems with hypoparathyroidism and pseudohypoparathyroidism, in contrast to previous chapters in which these problems were discussed in children. It provides clinical information on medical history, clinical symptoms and medical management. Up-to-date information is summarized about the genetic abnormalities associated with hypoparathyroid disorders as well as disorders such as pluriglandular autoimmune hypoparathyroidism. Blomstand’s disease, mitochondrial disorders associated with hypoparathyroidism, and recessive hypoparathyroid. I am grateful: to the Medical Research Council (UK) for support and to Mrs Tracey Walker for typing the manuscript and for expert secretarial assistance.